The Cox Foundation is pleased to announce a new partnership with AAD on the production of two podcasts that give listeners an inside look into what diplomacy is and what it looks like on the ground, straight from the diplomats and US agency officials that make it happen. Learn more here. “The General and the Ambassador: A Conversation” is a podcast series that brings together outstanding diplomatic and military collaborators to recount stories of representing and defending U.S. interests abroad. The host, Ambassador (ret.) Deborah McCarthy brings these stories to listeners in thirty-minute episodes. Guests have included General David Petraeus and Ambassador Ryan Crocker as they discuss their partnership in Iraq, Admiral James Stavridis & Ambassador William Brownfield as they discuss the transformation of Colombia, and General Jack Gardner and Ambassador Kate Canavan on U.S. military and diplomatic work at the U.S. European Command in Germany. Stay up-to-date. Find them on iTunes here. “American Diplomat: Real Stories Behind the News” provides informative entertainment to the listening public from our nations’ diplomatic practitioners. The conversations with this elite cadre of career diplomats give the listener a better understanding of the very human dimensions of those serving on the front lines of war, crises, and conflict around the world. Ambassador (ret.) Pete Romero and Ms. Laura Bennett (a writer and videographer) host weekly, 20-40 minute podcasts featuring conversations with active duty and retired U.S. diplomats. These intimate, lively, and informative conversations center on personal recollections and reflections… the stories of diplomats, as they succeed, fail, and enter the fray again to advance U.S. national interests overseas. They discuss what they really think about dealing with foreign leaders and reveal their thoughts about dealing with tribal leaders, militias and thugs. Never miss an episode! Find them on iTunes here. 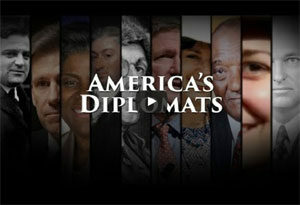 Learn more about “American Diplomat” here. In partnership with the Cox Foundation, USGLC hosts events around the country to educate and inspire support from the American public and policymakers on the importance of America’s diplomacy and development. The AFSA Speakers Bureau, with support from the Cox Foundation, reached nearly 4,000 people in 2016. The Speakers Bureau works to build a “fan club” of globally engaged citizens by raising awareness about the Foreign Service and its work. The Speakers Bureau provides a range of organizations – including the Council on Foreign Relations, the World Affairs Councils of America, the US Global Leadership Coalition, and many more – with access to experienced foreign affairs professionals to speak at chapter meetings and events or participate in education, mentoring or advisory programs. “Support for American Jobs, Part II: A new Government-Business Partnership for Commercial Diplomacy” is the latest report based on business views of U.S. commercial diplomacy programs, prepared by the American Academy of Diplomacy under the direction of the Cox Foundation. Building upon the findings of “Support for American Jobs, Part I: Requirements for Next-Generation Commercial Diplomacy Programs,” Part II highlights the best practices of foreign commercial diplomacy programs and implications for the United States, best practices of public-private partnerships to inform and facilitate further collaboration between the US government and private business, and a selection of pilot training sessions. Learn more about the Academy’s work on Commercial Diplomacy here. The Cox Foundation provided support for promotion of America’s Diplomats. The documentary has reached nearly half of US TV households with multiple PBS runs. From Ben Franklin to Benghazi, America’s Diplomats takes you inside the Foreign Service and behind the scenes of U.S. Foreign Policy. Discover the role our diplomats play in shaping American history. Uncover the origins of our Foreign Service, and the danger American diplomats face far from home.